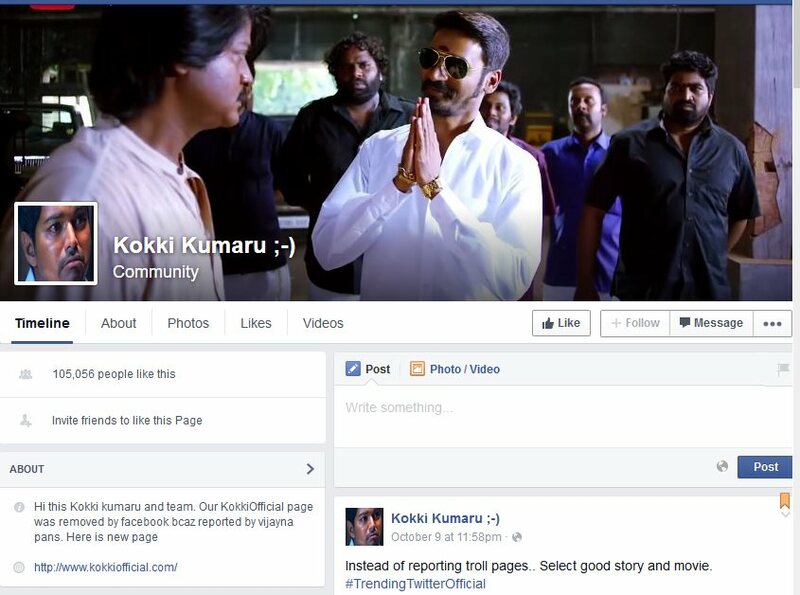 Vijay sacks Facebook troll page... Kokki Kumar reborn! Home » Facebook | Fans | Vijay » Vijay sacks Facebook troll page... Kokki Kumar reborn! Kokki Kumar's page, the mysterious Facebook troll star of Tamil Nadu, has brought down after a complaint from Ilayathalapathy Vijay's production house, SKT Cinemas. The whole Kollywood even Vijay fans were subscribed to KoKki Kumar's page. Kokki Kumar is known for trolls against actor Vijay. Pages like Konjam Nadinga Ajith are still live while Kokki Kumar opened up a new page and got almost 99000 likes within a day. Trolls are cool and sometimes hurting, it's not surprising that the production house run by Vijay complained about Kokki Kumar's page. Soon after, here is the response from the page owners. Basically, the social networks are the main battlefield of Vijay and Ajith fans, wonder what if Ajith ever visited Kokki Kumar's page. We can't ignore the contributions by the Tamil Troll pages. Free promotion, is that what they're doing sometimes it does end up in insulting popular film stars like Vijay. Sources say that Kokki Kumar page is run by a group more than 11 people. The production house is facing huge losses due to the trolls shared by Kokki Kumar. When actors funding pages, when people share pages, images, posts, most of the time they don't know what they're up to. Kokki Kumar's twitter handle has 33000 followers and his new facebook page has got almost 100000 likes.